In what's expected to be one of the most complicated bankruptcies in recent memory thanks to the involvement of indignant state and federal regulators, activist shareholders, worried bond holders and angry fire victims, PG&E has officially filed for bankruptcy. The Wall Street Journal reported that as we previewed last night, the troubled utility which serves 16 million California customers, filed for bankruptcy early Tuesday, claiming more than $50 billion in debt. Facing what some analysts estimate could be some $27 billion in fines relating to the role of malfunctioning equipment in causing wildfires, the bankruptcy process is expected to be a protracted mess as state and federal regulators try to figure out the best plan for holding the country's largest utility accountable. When it's all said and done, the outcome is expected to have wide-ranging implications for utility customers, fire victims, shareholders and wholesale power providers. One thing is clear: the bankruptcy is bad news for Californians, who could face double-digit increases in their energy bills despite already paying some of the highest rates in the country. The bankruptcy could also be problematic for wholesale power providers like NextEra and Consolidated Edison as PG&E is expected to try and renegotiate contracts to purchase wind and solar power after cancelling some $34.5 billion in longstanding contracts. "It could have a real ripple effect throughout the power industry, not just with respect to the existing contracts that are there," said Luckey McDowell, a partner in Baker Botts’ restructuring group. "It could have a chilling effect in respect to new investment." By declaring bankruptcy, PG&E becomes not just a 'fallen angel' - a term used to describe firms that go bankrupt shortly after losing their Investment Grade rating - but a 'failing angel' - a term coined by BofA indicating that a firm went from investment grade to bankruptcy within the span of a year. 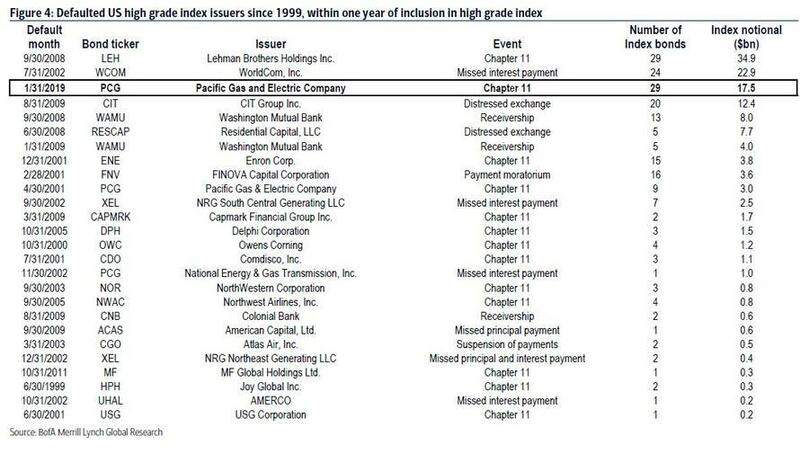 PG&E also joins Lehman Brothers and WorldCom. And it become only the fourth 'failing angel'. 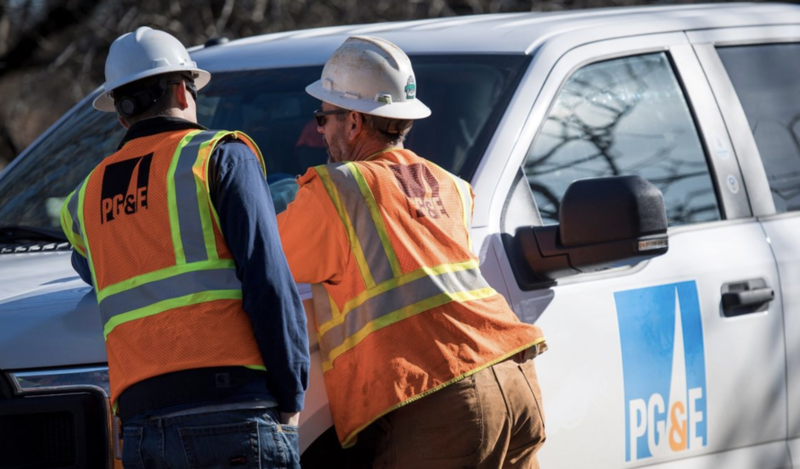 Before filing, PG&E rebuffed two rival financing bids, one led by Elliott Management Corp. and the other led by Citadel, that sought to help the company avert a bankruptcy filing. "There are some bankruptcy cases that get finished very quickly," said Melissa Jacoby, a law professor at the University of North Carolina at Chapel Hill. "This is just not one of those cases." Some state officials have publicly mulled a state-sponsored plan to break up the utility, the country's largest. At one point, lawmakers had considered a plan to help PG&E pass on fire-related liabilities to its customers, but reluctance to be seen as bailing out the utility ultimately killed that plan and led to PG&E trying - and failing - to call lawmakers' bluff. The company is set to hire turnaround specialist James Mesterharm as its chief restructuring officer to help the company navigate bankruptcy proceedings.